The power bank which provides long lasting charging will be launched on Flipkart on 16th March. The product has a unique current shunting system that enables the connected devices charge in stages. Syska Accessories has launched the Power Vault 200 power bank and will be available at Flipkart on 16th March at an introductory price of Rs 1,299. 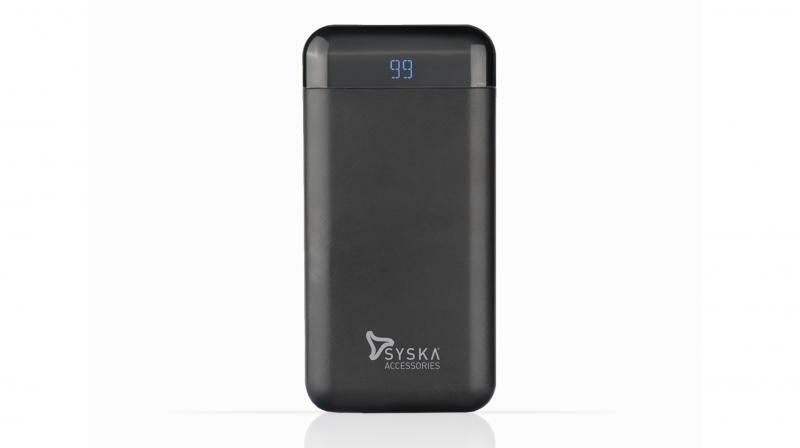 The Syska Power Vault 200 is a multifunctional power bank that comes in White and Black colours and is equipped with a large Grade A+ 20000 mAh lithium polymer battery. Syska and Flipkart have established a strong partnership as Syska Group sells its mobile accessories and personal care products through the e-commerce platform. This partnership will help Syska further build its online presence as lithium polymer power banks are likely to be the next generation of power banks, helping the category continue its strong growth online. The product has a unique current shunting system that enables the connected devices to charge in stages. The built-in intelligent circuit control can shunt the current when the power bank is self-charging and outputting power at the same time. This helps while charging more than one device at the same time, ensuring that all the devices are charged uniformly and at a faster speed. The built-in overcharging and discharge protection system ensures that there is no drain or stress on the Power Vault 200’s batteries. This ensures that the power bank efficiently uses the power stored within it, and maximizes its usage per charge. An intelligent circuit system in the Power Vault 200 protects it when charging, and also when the charge is being discharged to other devices. Syska Power Vault 200 gives you up to 500 times of charge/discharge cycles. By the modulation of pulse width, the power bank can reduce the energy consumption of recharging to prolong the battery life. The digital display provided on the Power Vault 200 helps you know the precise charge levels of the power bank, displayed in percentage points. With this, one will know well in advance as to when the power bank needs to be re-charged. Power Vault 200 comes with multiple connectors like 2 Standard USBs, One Micro USB for input and one USB type C port for input as well as for output. The product is compatible with a wide range of devices including Laptops, Digital Cameras, Gaming Consoles, iPods, Mp3/Mp4 players, Tablets, PDAs, Bluetooth Speakers, Headphones, Android or iPhones. Power Vault 200 comes with a 6 months warranty against any manufacturing defects. The warranty will be effective from the date of purchase of the product.